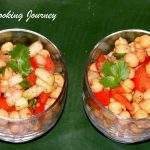 Chaat is something that we all love to eat, but unfortunately there are no Indian chaat places near where we live. 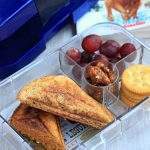 To satisfy our cravings, I have to make these at home. 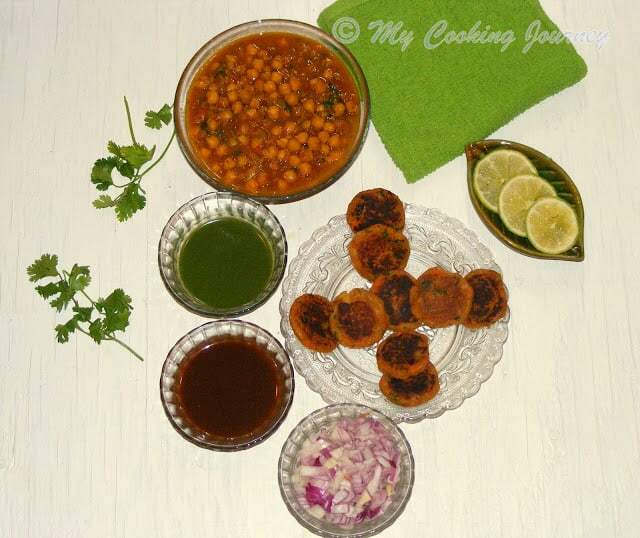 When I saw this chaat as an option for the combo dishes, I wanted to make it right away. 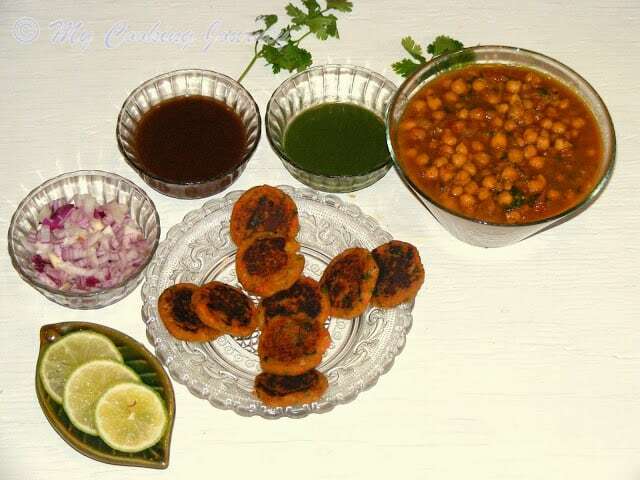 I have made aloo tikki by itself, but have never made it as a combo with channa. 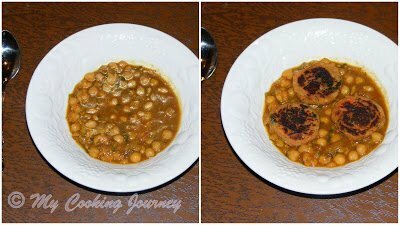 I would definitely be making more channa/chole next time to eat it with the aloo tikki. Usually when I make the chole/channa, I make my own masala powder. 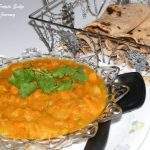 Only when getting ready for this post, I realized that I don’t have the channa recipe in the blog. 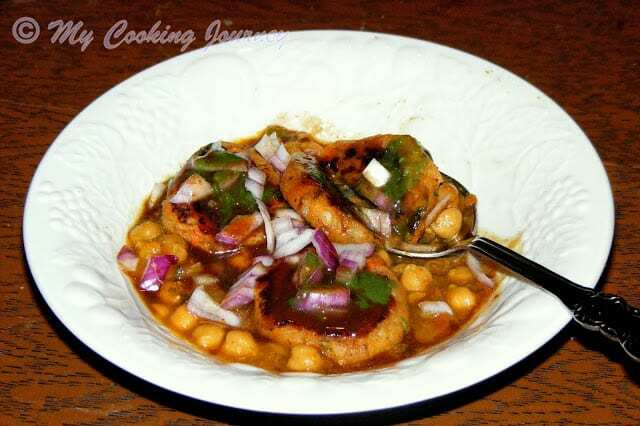 I will be posting my routine channa recipe soon and in the meanwhile this is my quick version of the channa that I made with store bought channa masala. 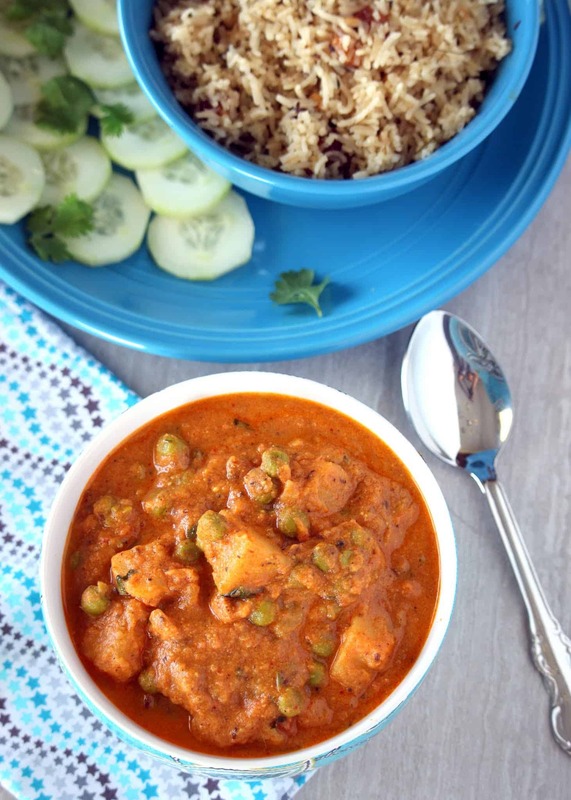 Once you have all the ingredients, the chaat is pretty quick to put together. 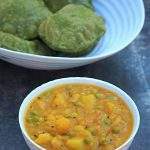 In this case I have also used store bought tamarind and green chutney (I always have a container of these in the refrigerator). 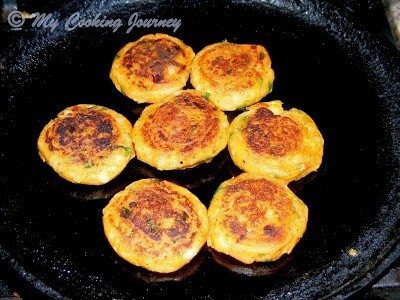 Also the aloo tikki can be frozen and reheated to make later. 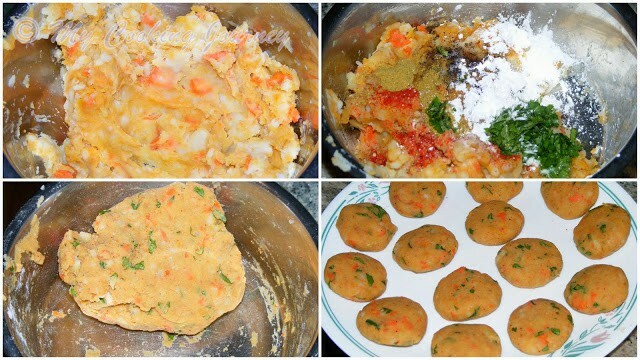 Boil the potatoes, sweet potato and the carrot and mash it up well using a potato masher. I cook the potatoes and the carrot in the microwave and then mash them. Make sure that the cooked vegetables are dry and not have too much moisture. 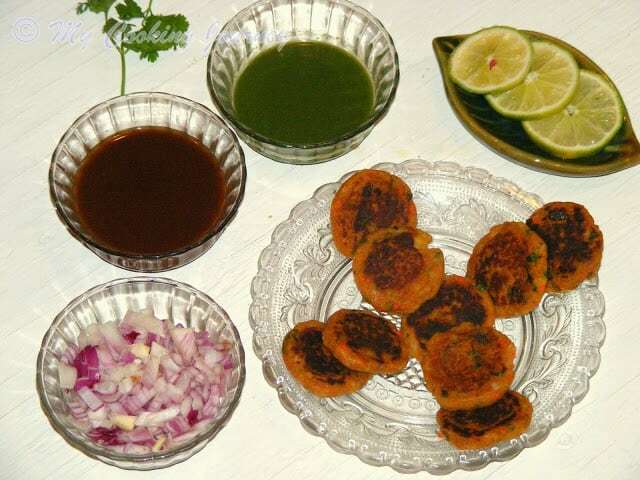 Add all the other ingredients mentioned for the aloo tikki (except the oil) and mix well. Form smooth dough with the mixture. 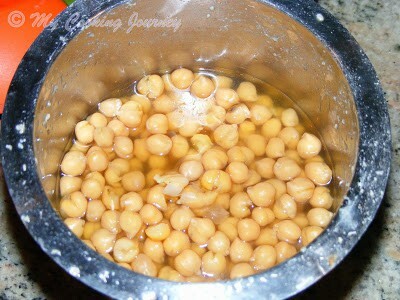 Divide the mixture into 12 or 14 equal size balls and then flatten it between your palms to make the tikki shape. 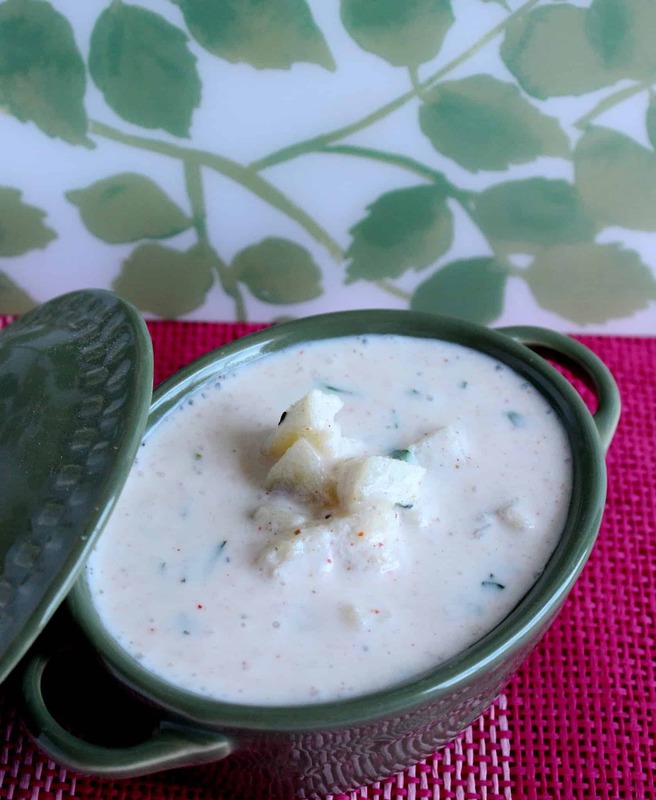 You could grease your palms to make a smooth tikki. Heat a tawa pan and grease it with about a tablespoon of oil. 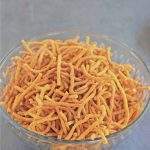 Now shallow fry the formed tikkis and cook it evenly on both sides until golden brown. Repeat for all the shaped tikkis and drain them on a paper towel lined dish. Keep it warm until ready to assemble. 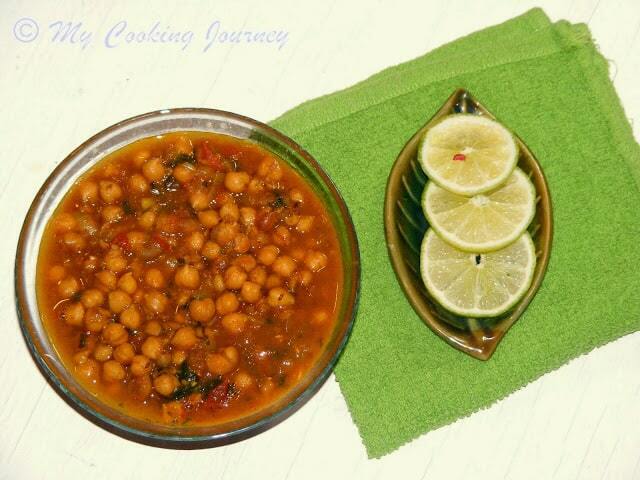 Soak the chole overnight and then pressure cook it in enough water along with the ginger garlic paste and salt. Cook it well until the beans are very soft. In a sauté pan, heat about 2 tbsp of oil and add the cumin seeds. When the seeds crackle add the chopped onions and green chilies. Sauté until translucent. Now add the chopped tomatoes and cook for 5 mins. Then add all the dry masala powders – turmeric powder, red chili powder, garam masala and channa masala and fry. Also add the salt at this stage. 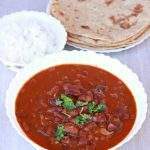 Be watchful when adding salt, since we already cooked the beans with salt in it. 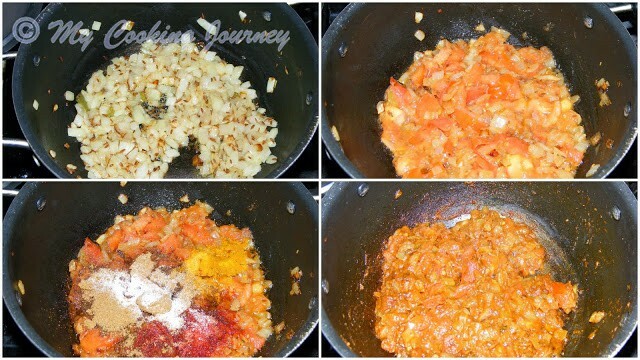 Fry the mixture until the oil floats to the top and the masala is aromatic. Now add the cooked beans and adjust the consistency of the gravy by adding enough water. 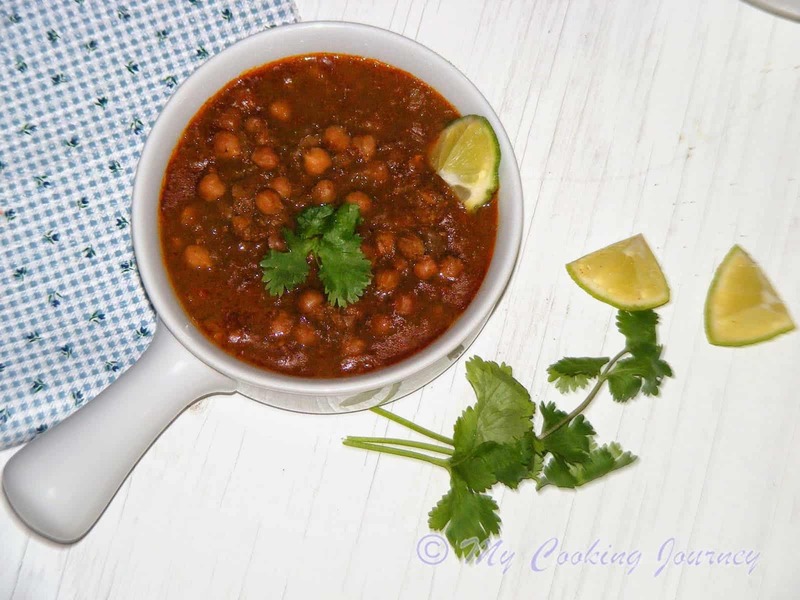 Boil the chole masala and then simmer it for about 15-20 minutes. Garnish with cilantro. 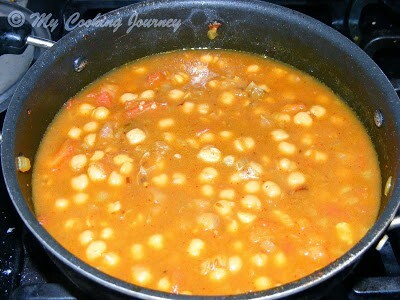 In a shallow bowl, add about 2 ladles of chole. 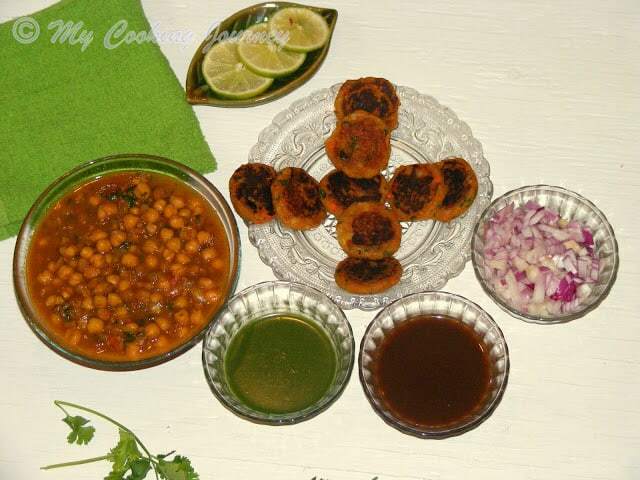 Now place 2 or 3 aloo tikkis on top of the chole. 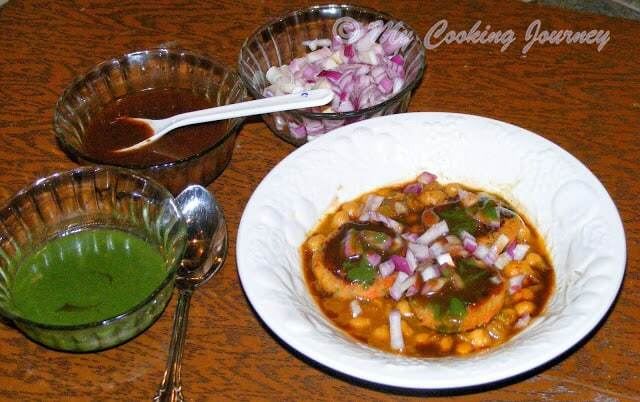 Sprinkle chopped red onions on top and then drizzle the tamarind chutney and green chutney over it. Garnish it with cilantro and sev and serve!